Feeling lucky? At Empire City Casino you can try your hand at hitting the jackpot on the gaming floor or by picking a winning horse at the historic Yonkers Raceway. Located less than two miles from the Bronx, the casino complex boast more than 5,000 slot machines and hosts twelve live harness races a night, five nights a week, year round. Every race night nearly 100 horses from around the Tri-State area travel to the historic track to carry on the century old racing tradition. Founded in 1899 as the Empire City Track by William H. Clark’s Empire City Trotting Club, the half-mile dirt track at the Raceway was built for standardbred harness racing, a practice that continues to this day. 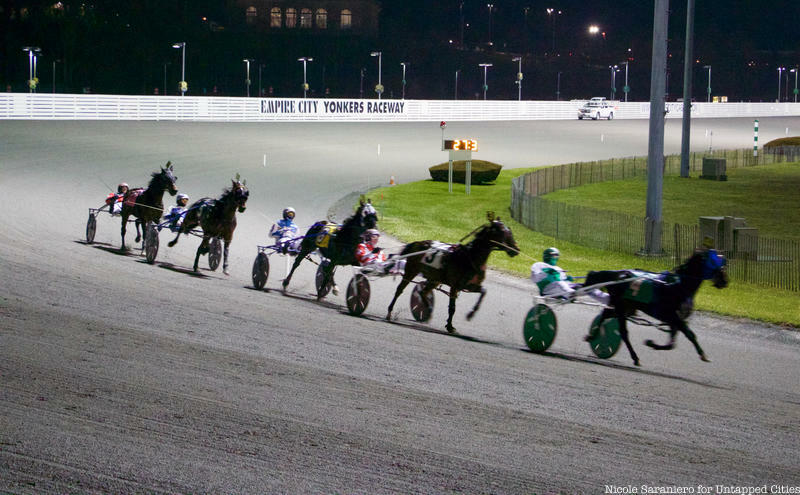 Throughout its long history, over one million horses have raced at Yonkers Raceway. Though originally built for harness-racing, thoroughbred racing was brought to the track in 1907 by the second owner James Butler and continued until 1943. During that time some of the most legendary thoroughbreds made history on the track including the infamous Seabiscuit. Seabiscuit was a champion thoroughbred racehorse who became the American Horse of the Year in 1938 after he beat Triple-Crown winner War Admiral (who also raced at Yonkers) by four lengths in a special race at Pimlico. He was the top winning racehorse of the 1940s and set a new record at Yonkers Raceway when he won the Scarsdale Handicap in 1936. In 2012, vice president of Empire City at Yonkers Raceway Bob Galterio told Wag Magazine that “Seabiscuit won more stake races at Yonkers’ Empire City then at any other racetrack.” Thoroughbred racing ended at the Raceway when harness racing was reintroduced in 1943.